That's right, while Batwoman has proposed to Maggie twice — twice on panel — DC not only refused to let the wedding be depicted on panel, but refused to let them be married at all. "[We] were told emphatically no marriage can result," said Williams on Twitter. He later added it was "was never put to us as being anti-gay marriage." Although how refusing to let people marry — even fictional characters — is not anti-gay marriage is beyond me. Williams and Blackman will leave the series after issue #26 in December; given that Batwoman is one of DC's best titles — and arguably its best-looking comic period, thanks to Williams' incredible art and panel experimentation — it's a loss readers will feel keenly, even if DC doesn't. Williams and Blackman say they're "heartbroken" to leave the title, and as a big Batwoman fan, I am too. Back in February, I posited that DC's refusal to publicize Kate's proposal to Maggie was an attempt to not give the press another reason to talk about noted homophobe Orson Scott Card's upcoming run on Adventures of Superman. I don't know if DC felt it worked, but given how happy DC was to promote Alan Scott's newfound homosexuality in the New 52 last year, I certainly found the lack of publicity significant. 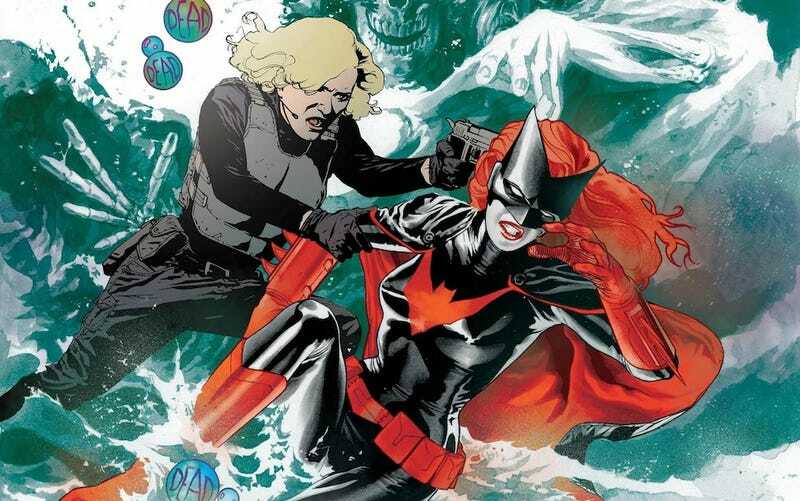 Can Batwoman&apos;s Gay Marriage Rescue DC Comics from Angry Fans? In the first draft of this article, I though DC was only refusing to allow the wedding to take place on panel, partially because I couldn't comprehend DC would not allow the character to get married. But as Williams' tweet above shows, I was wrong. This is completely insane, and it goes well beyond DC's refusal to publicize an in-universe, homosexual character's proposal to her partner. Leaving aside why DC would piss off one of their best creative teams, I can't fathom why DC would think this was a good idea, or at least not realize what a horrendously bad idea it is. Perhaps they thought that by never bringing it up they could keep the controversial Card hire from getting back into the spotlight, but surely someone at the company realized that allowing the marriage to take place would be a lot less controversial than refusing to let the marriage take place. Did they really not think it would come out? Who are they trying to please with this decision, other than Orson Scott Card and his ilk? Are they really worried about Card's feelings more than the majority of their readership? Originally, I asked if DC realized ignoring the problem isn't actually a solution, but instead another part of the problem. Let me amend that: DC clearly has a problem here. And the fact that they don't seem to even realize it has a problem is possibly the biggest problem of all.